This is from North East Anti-Fascists facebook. Solidarity with all those stopping the fascists in Millfied tomorrow. We live in a time of political and economic crisis. Far-Right fascist groups like the EDL, BNP and National Front are trying to exploit this by shifting blame onto immigrants, but it wasn’t immigrants who caused the banking crash or who are dismantling the welfare system: it’s the rich and powerful. Groups like the EDL do not protest against cuts and job losses, but they have physically attacked those who do: for example, in the last year fascists have attacked the Occupy camp and a socialist meeting in Newcastle, and picket lines and a trade union office in Liverpool. Fascist groups like the EDL are ANTI-WORKING CLASS. All they ever do is stir up racism to divide the working class against itself so that the rich can continue to shaft us. It wasn’t immigrants who shut down the pits or the shipyards: it was the Tories. It was Labour who sold off all the public housing stock and brought in workfare. Know your REAL enemy: it’s the boss class scum, not immigrants. 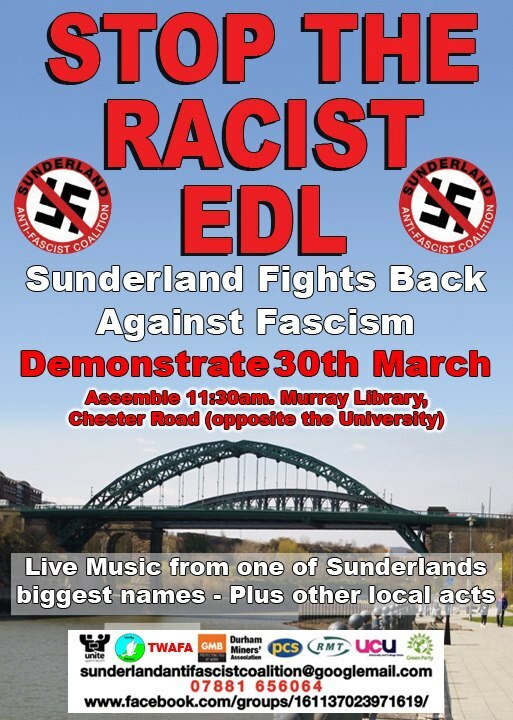 The EDL are coming to Sunderland again on March 30th to try and spread racism and divide our communities. The only people who will gain from this are the ruling class. We say, take to the streets and stop the fascist EDL in their tracks! Fascists and Nazis are class traitors.Stop the EDL from marching in Millfield. ne-antifascists@riseup.net | Look for us on Facebook! This is the poster for the fluffy demo.